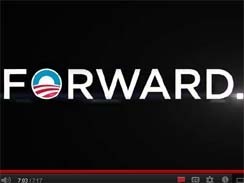 Obama's 2012 campaign pitch: "Forward"
(CBS News) In 2008, the Obama campaign was arguing for hope and change. This year, the president's re-election campaign is asking Americans to move keep moving forward. President Obama's campaign on Monday released a seven-minute video entitled "Forward," which they're using to kick off the general election. The video reminds viewers of the dire state of the economy in early 2009, when Mr. Obama took office, and all that the president has accomplished since then -- even in the face of Republican obstruction. Over images of everyday Americans, the video goes through a laundry list of Mr. Obama's accomplishments: the economic stimulus package he says saved as many as 4.2 million jobs, the end of the Don't Ask Don't Tell policy discriminating against gays in the military, the end of the Iraq war, the changes to regulation of Wall Street and the credit card companies, the auto bailout and more. Over a picture of Mr. Obama, a narrator says, "Hard work, determination, real results." The video then castigates Republican for their opposition to the president's agenda. "Instead of working together to lift America up, Republicans were waging a campaign to tear the president down," the narrator says as the video shows images of congressional Republicans. The campaign will play the video during Mr. Obama's first official campaign rallies Saturday in Ohio and Virginia. The Republican National Committee seized on the video to slam Mr. Obama's record on the economy, creating the nationally-trending Twitter hashtag #Forward." The RNC used the hashtag to tweet messages like, "Under Obama's budget, Americans can look #FORWARD to $1.9 trillion in higher taxes." The Romney campaign, meanwhile, released a minute-long video slamming the president on government spending, specifically citing the spending scandal at the General Services Administration.